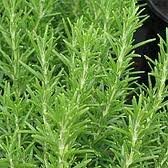 A hardy evergreen perennial with a height and spread about 90 cms. It has short needle shaped aromatic leaves and produces small blue flowers. Because of its aromatic flavour it is widely used in cooking meats especially lamb. It has been known as the 'herb of memory', said to help improve concentration and memory. It is also supposed to stimulate the circulation, making it beneficial for low blood pressure. It can have a stimulating effect and help overcome anxiety and mild depression. 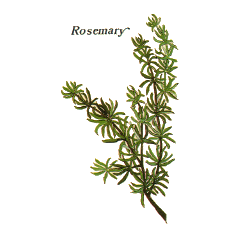 Burning sprigs of rosemary freshens a room and may stimulate the mind.